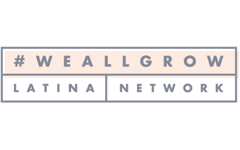 Disclaimer: This is a sponsored conversation written by me on behalf of Kikkoman, in collaboration with Latina Blogger Connect. However, all the opinions, stories, experiences, and recipes are mine. Last week I had lunch in La Balanza, one of Lima’s trendiest spots for eating out, with my brother who was visiting Lima for a few days. 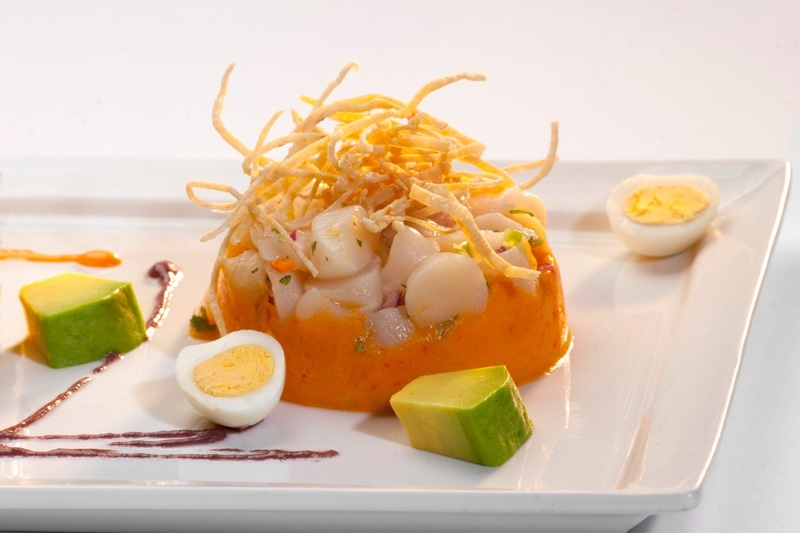 As you may remember, my brother runs a Peruvian restaurant in El Salvador, and loves eating out as often as possible when he’s in Lima, to try all the new flavors out there. 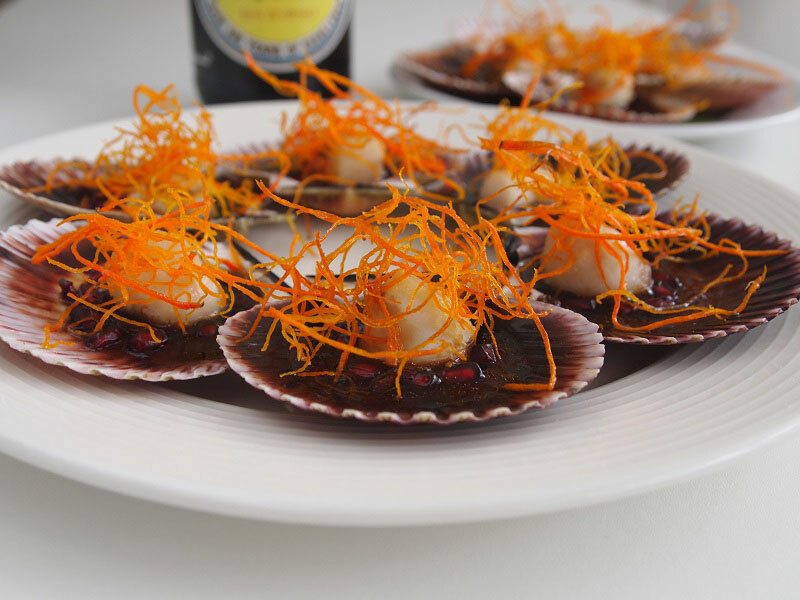 We shared many dishes that day, amongst them the tastiest appetizer I’ve had in quite a while: grilled scallops with a pomegranate sauce. They looked very fancy and tasted absolutely delicious, so I made a mental note to make them at home as soon as possible. That is the inspiration behind the dish I’m sharing with you today, with the only difference that mine is very easy to make and not as complex or time consuming as the restaurant version probably was. The key ingredient I used to give flavor to this dish is Kikkoman Soy Sauce, a basic staple in my kitchen. This traditionally brewed soy sauce is a versatile ingredient that can be used to cook many different types of cuisines, and that’s why I use it in so many different dishes, including many of my favorite Peruvian recipes. 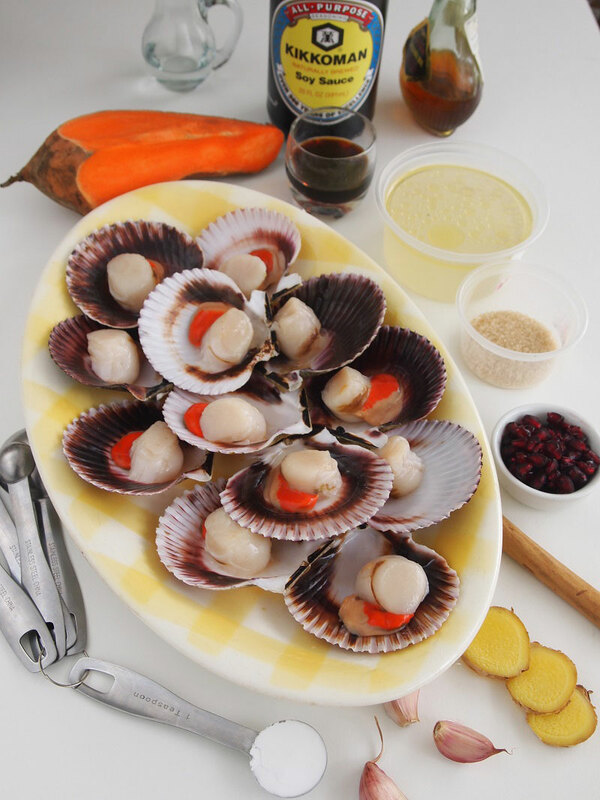 For this dish you need to buy the freshest scallops you can find in the market. Discard the roe (although some people like it, and it gives the dish a beautiful color), and wash them well. If you live in the US you hardly ever see scallops sold with the roe anyway, so you don’t even have to worry about this. The second step is to make the fried sweet potato strings, (or use regular potatoes or yucca if you want). 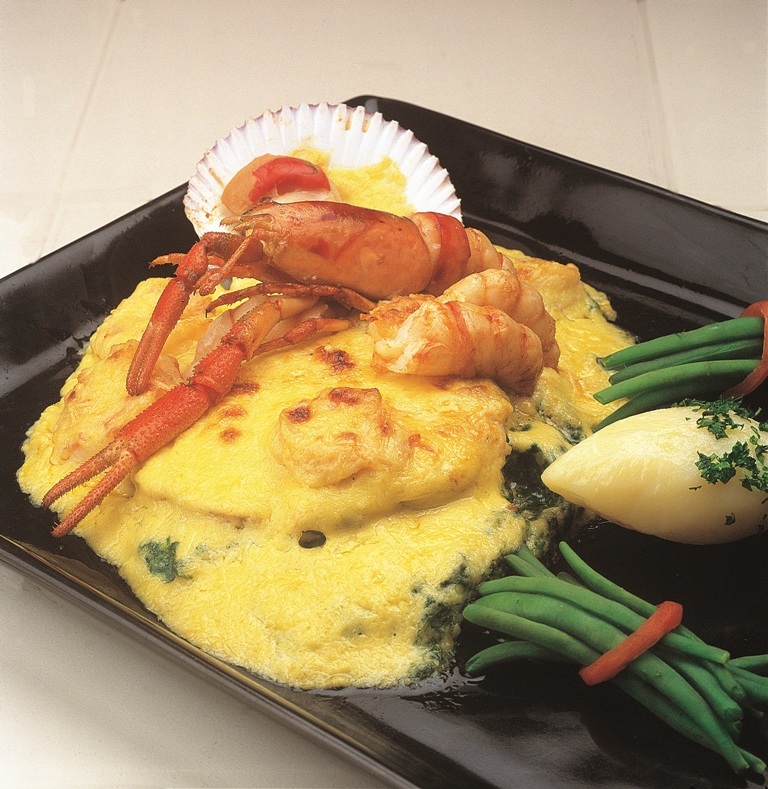 The idea is to add a crunchy texture to the tender scallops. Using a mandolin, cut the sweet potato into very thin strings. Put them in a bowl with fresh water, changing it every time it turns cloudy because you want to get rid of the sweet potato starch. 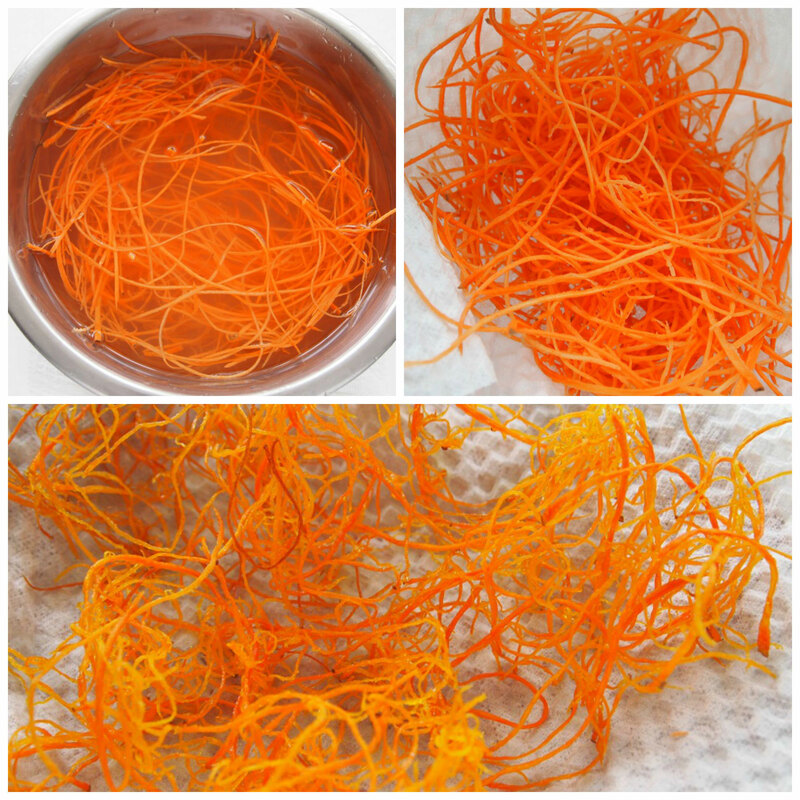 When the water is clear, dry the sweet potato strings very carefully with paper towels, and fry in batches in hot oil until their color changes (but don’t let them turn golden brown because they will burn). Drain in paper towels. The best thing about these strings is that they can be made a day in advance. Once they are completely cool, you can keep them in a tightly closed container so they remain crispy. 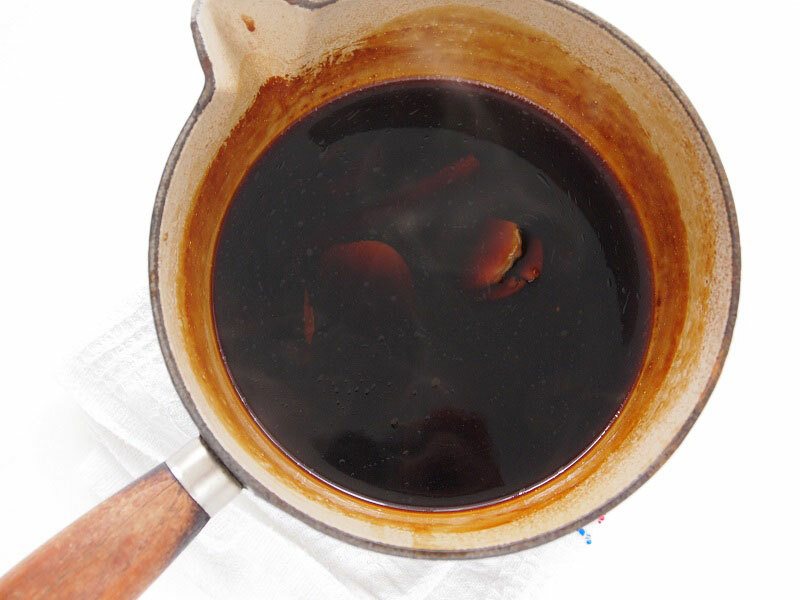 To make this delicious soy sauce just combine the ingredients in a small saucepan and bring to a boil. Kikkoman Soy Sauce is the magic ingredient here. Since it’s a flavor enhancer it will give this sauce all the flavor it needs and you won’t even need to add salt or pepper. However, I suggest you use a flavorful broth. You can also add scallions, a cinnamon stick or a star anise if you like more complex flavors. This soy sauce will also give this appetizer an amazing rich color, as it’s an excellent browning sauce to use in any dish. Its distinctive reddish-brown color and that characteristic rich, yet mellow flavor are all the result of its process of aging, which takes months just like fine wine. Once it boils, turn the heat to medium and keep boiling for 10 minutes or until syrupy. Sometimes I add a mixture of one teaspoon cornstarch dissolved in a little water to thicken the sauce and give it a beautiful gloss. Or add a tablespoon of cold butter to the hot pan and you will get a similar effect. This sauce is so good that I use it in chicken and pork recipes too. Try it and you will see for yourself. It’s even delicious with stir fried veggies and rice. Sometimes I add chopped chili pepper to the sauce to give it a kick, or use honey instead of sugar. I could have broiled these scallops, like our famous conchitas a la parmesana, but despite it being winter in Lima, the day was hot and I did not want to turn the oven on, so I seared them in a skillet for 30 seconds or so. The idea is that they remain juicy and almost raw in the center. Avoid overcooking them, which can happen very easily since they’re so delicate! Put them back in their shells or wherever you’re planning to serve them (small ramekins are a good choice). 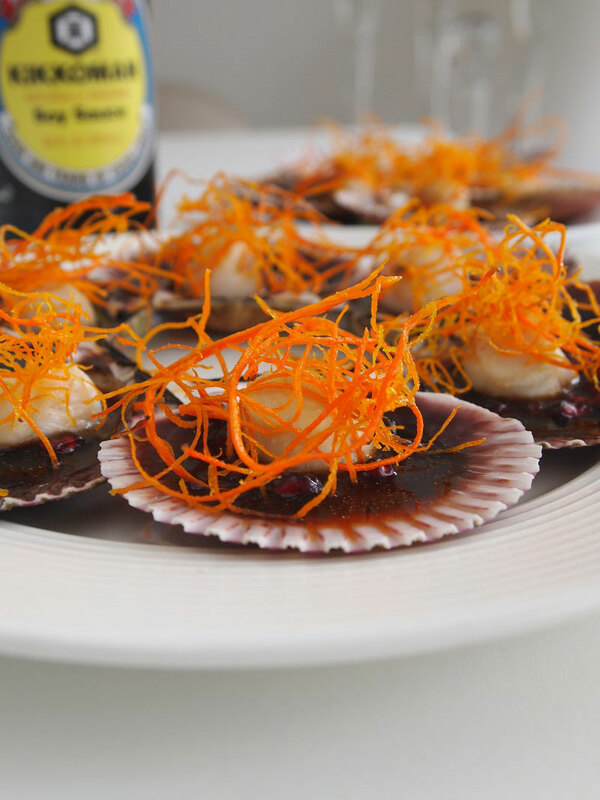 Add a teaspoon of the sauce to the scallops, some pomegranate seeds if they are in season and if you feel like it, and top with the crispy sweet potato strings. Serve immediately. Note: To make this sauce even more exquisite, add 2 tablespoons Pisco or Brandy, and finish with a teaspoon of sesame oil. Yum! Peel and slice the sweet potato into very thin strings with a mandolin. Plunge in a bowl of cold water. Change the water when it's cloudy, until it is completely clear. Drain the sweet potato strings and dry very well. Heat the oil and fry the sweet potato strings in batches. Transfer to paper towels to drain the oil. In a small saucepan, combine the fish or chicken broth, sugar, ginger, and garlic, and bring to a boil. Turn the heat to medium and boil for 10 minutes or until the sauce is reduced and slightly thick and sirupy. Heat a teaspoon of oil in a skillet. 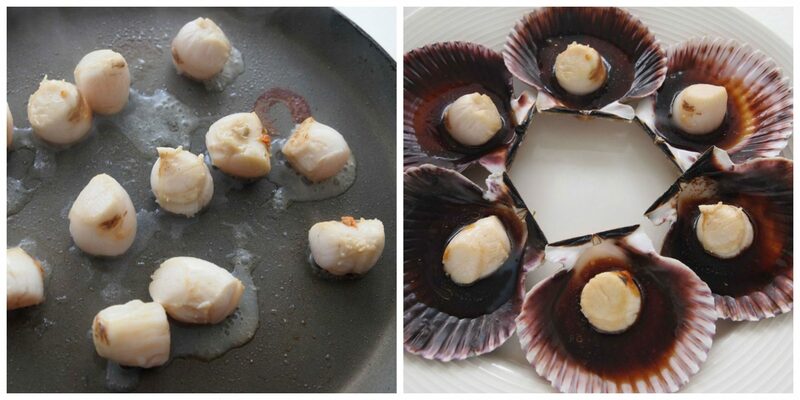 Sear the scallops and transfer to their shells. 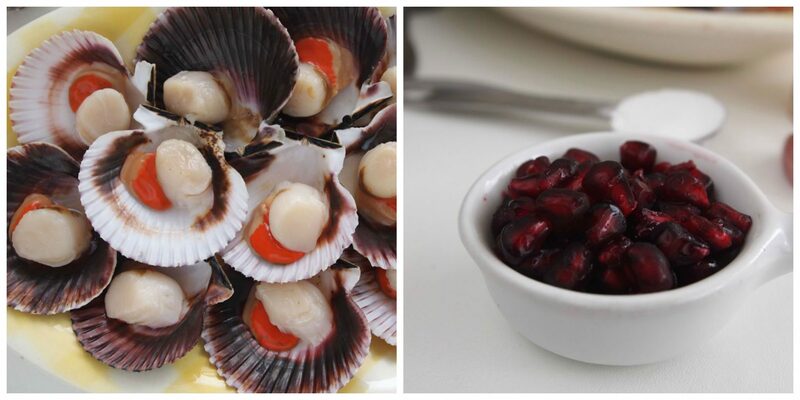 Add a teaspoon of the sauce on top of each scallop, and sprinkle with pomegranate seeds, if using. Top with sweet potato strings.